The CDE-136BT lets you enjoy radio with excellent digital sound quality via its built-in DAB, DAB+ and DMB tuners. It provides Service Search and automatic switching between DAB and RDS (depending on regional availability). It also has a DAB antenna power supply. An optional Alpine DAB antenna is available (KAE-220DA). Featuring Parrot Bluetooth capability, this CD Receiver gives you hands-free operation of your Bluetooth-enabled mobile phone with full phonebook access. BT Plus offers many new functions, such as received SMS text message alert, GSM signal strength indicator, automatic phonebook update, alphabetic phonebook search, 5 echo cancellation presets, ID3 tag display when streaming music (if supported by phone), battery charge indicator and several more. You can control your iPhone/iPod from the head unit, using Quick Search to find songs fast. Direct iPod Control Mode lets you use the iPhone/iPod interface for direct operation and for viewing information in your desired language. This comes especially handy when a passenger selects the music while you keep your eyes on the road. Connect your iPod® or iPhone® via the CDE-136BT's rear USB port (requires KCU-442i or the original Apple USB cables that comes with your Apple product). No matter what source you use for your favourite sounds:MP3, WMA or AAC, the CDE-136BT is built to handle it. And if you use more than one source, all the better! 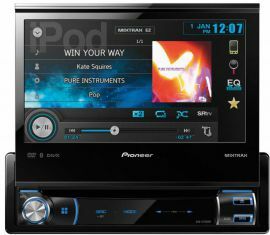 Naturally, because this is a top quality head unit, the music always sounds extremely clear and lifelike. Expand your listening choices by plugging your USB mass storage devices into the rear USB port. There's also a 3.5mm mini jack for MP3 players. You can adjust the Head Unit's button illumination colour to match your dash. The main button can be switched to green, blue, red or amber illumination, while the other buttons can be set to green or red illumination.